Colorful and bright disposable tableware features flowers in red, yellow, and pink with green and blue leaves. The plates have wide rims for an added elegant touch. This pattern is well suited for a Bridal Shower, Garden Party, Bat Mitzvah, or any spring / summer event. 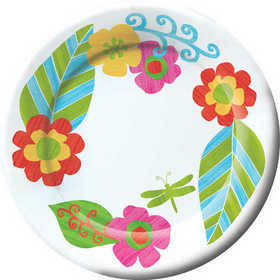 Marabella Wide Rim 8" Dessert Paper Plate 8 ct.
Marabella Floral Lunch Napkins 16ct. Marabella Floral Beverage Napkins 16ct. Marabella Floral Guest Towels 16 ct.
Marabella 9 oz. Hot/Cold Paper Cups 8ct. Marabella Floral Plastic Tablecover 54" x 108"